The Hollywood Reporter reports that alt-right activist and Breitbart technology editor Milo Yiannopoulos has inked a $250,000 book deal with Simon and Schuster. If you're not a Breitbart reader or a member of the alt-right political movement, than you may know Milo as the guy that got permanently banned from Twitter for bullying Saturday Night Live star Leslie Jones. Ah yes, that Milo. Milo is an outsize personality who loves to shock. A gay conservative activist, he despises political correctness. His detractors say he is a bully, a racist and a misogynist. He says he stands for freedom. So how did he end up doing business with Simon and Schuster? He told The Hollywood Reporter, "I met with top execs at Simon & Schuster earlier in the year and spent half an hour trying to shock them with lewd jokes and outrageous opinions. I thought they were going to have me escorted from the building -- but instead they offered me a wheelbarrow full of money." He also crowed to the magazine, "They said banning me from Twitter would finish me off. Just as I predicted, the opposite has happened." 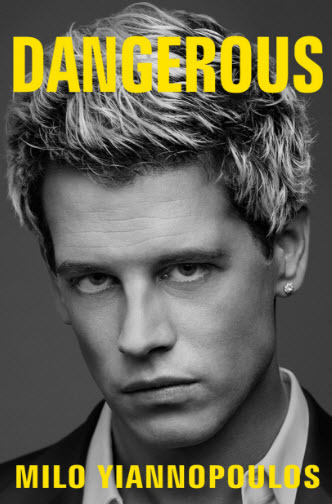 Milo's book will be called Dangerous and will be published by Simon and Schuster's Threshold imprint. The tagline for the imprint is "Celebrating 10 Years of Being Right!" Rush Limbaugh, Karl Rove and President-elect Donald Trump have all published books with the imprint. The book will hit bookstores on March 14, 2017.